The King’s Office supports the King in the exercise of his constitutional duties and acts as a link between the King and his ministers and state secretaries. The King’s Office is based on the Korte Vijverberg in The Hague. Its tasks are set out in a Royal Decree of 18 December 2003, and the Prime Minister bears ministerial responsibility for the Office. It has a staff of about 30 and consists of three divisions. 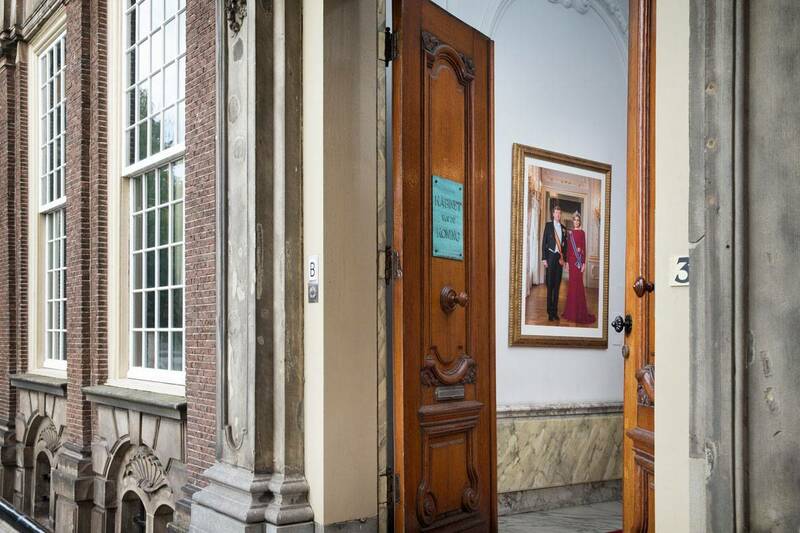 Entrance to the King's Office in The Hague. In addition, it compiles briefing materials for the King prior to state and working visits. These visits, whether in the Netherlands or abroad, are prepared in close cooperation with the Royal Household and the Government Information Service. The Legislation and Petitions Division (WRV) has three main tasks. It submits all state documents, like Acts of Parliament, Royal Decrees and treaties to the King for signature. It also informs the King about petitions that have been received and passes them on to the member of government responsible for the relevant policy area. Finally, it organises and files all state documents and transfers them to the National Archives after the statutory retention period has elapsed. The Support Unit is responsible for internal operational management, including personnel policy, financial management, IT and facilities.